In order to constantly monitoring a dynamic environment, e.g. obtaining the motion trajectory of each moving object that entered the scene, a network sensing system is being developed using single-row laser scanners. Laser scanners are set on the road side to profile an intersection horizontally from different viewpoints. This is done so that cross sections of the intersection are captured at a high scanning rate (e.g., 37Hz) and to contain the contour points of the moving objects entering the intersection. Different laser scanners data are integrated into a common spatial-temporal coordinate system and processed. Thus, the moving objects inside the intersection are detected and tracked to estimate their state parameters, such as: location, speed, and direction at each time instance. A number of experiments have been conducted in different intersections in central Beijing, where digital copies of the dynamic intersections were obtained during long time span, e.g. whole days. By analyzing the motion trajectories, traffic behaviors of different moving objects in different time span are reflected. Zhao, H., Sha, J., Zhao, Y., Xi, J., Cui, J., Zha, H., Shibasaki, R., Detection and Tracking of Moving Objects at Intersections using a Network of Laser Scanners, IEEE Trans. Intelligent Transportation System, 2012. 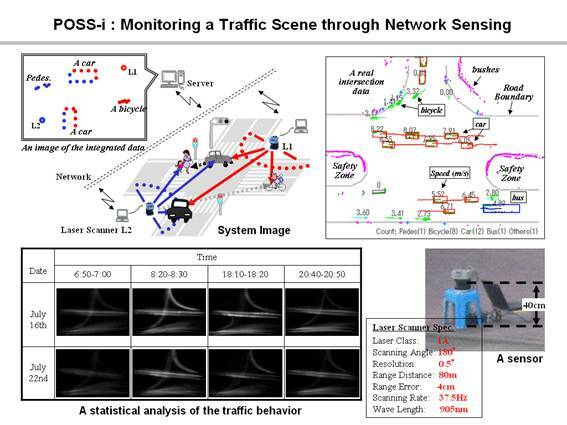 Zhao, H., Cui, J., Zha, H., Katabira, K., Shao, X., Shibasaki, R., Sensing an intersection using a network of laser scanners and video cameras, IEEE Intelligent Transportation Systems Magazine, vol.1, no.2, 31-37, 2009. Zhao, H., Cui, J., Zha, H., Katabira, K., Shao, X., Shibasaki, R., 2008, Monitoring an intersection using a network of laser scanners, Proc. IEEE Int. Conf. on Intelligent Transportation Systems (ITSC08), 428-433, 2008. The POSS is part of the School of EECS, Peking University..